Can native ingenuity defeat gun laws ? This "portfolio" of homemade Chechen weapons seems to suggest it ! Interesting, but don't read the comments. It will hurt your brain. The capacity to reason in some folks is about as derelict as the firearms pictured. Some people are morons. plain and simple. Though this article gets posted a lot, I still find it interesting to look through. why did you say that, I had to go and start reading. All models soon to be available at your local large sporting good stores. Wow, that's some seriously wild stuff. I see a modded PTRD, M-N, DShK, a couple crappy antique revolvers, the worst hack-job AK EVAR (silenced, no less, it seems), a hand-carved copy of something or other, a SAA grip stuck onto a cut-down O/U, and a bunch of tube guns/pseudo-tube guns. Wow. I wish these souls lived in a different part of the world so they could put their mechanical talents to more fruitful ends. The US "let's put a cupholder on a pic rail" arms industry could use some of that hot-blooded ingenuity and talent, methinks. 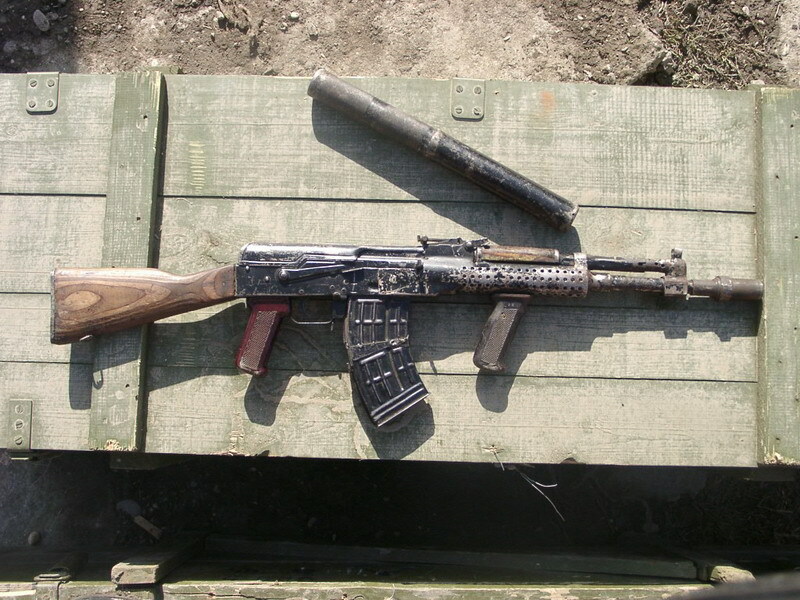 Are those two SVD mags welded together on that "AK"? Was the receiver originally from an SVD? I think this is further proof that a "government" can not successfully disarm a population that is determined to be armed. Yes the examples are crude, ugly and probably dangerous as hell to operate, but like the Liberator pistol of WWII they can be the first step in obtaining more practical arms. IIRC, clandestine machineshops in both Ireland and Poland were able to make submachine guns of reasonable quality in some numbers during conflicts there. Open-bolt blowback SMGs are probably the easiest firearms to make. And these guys, along with the Afghan gun makers, probably don't even have electricity, and are making locked-breech weapons. If they had access to good quality materials and CNC lathes and mills, they would do John Moses Browning proud. "If you want guns bad enough, you can get 'em" should be accepted as a fundamental axiom of life and governance in the 21st century. There were quite a few tech-9 lookalikes in the pile there. I guess some things transcend national boundaries. Governments are never a true inpedement to those willing to face the consequences of defiance. Looks like Hi-Point could learn a few things from them! Hi-Point was going to put a factory there until they found out the trained monkeys didn't like the cold weather. You should have seen some of the stuff that came out of the Philippines. Made the Chechen stuff look unimaginative and sloppy.